Protestants generally know it was Luther’s Ninety-Five Theses which served as the spark for the Reformation, but very few have actually read them, and probably fewer have understood them. Written, as they are, in an entirely different context and addressing a very specific and nuanced theological/ecclesiastical issue, the Ninety-Five Theses can be difficult to wrestle with. Thankfully Timothy Wengert has written a concise, insightful, and accessible commentary on the document. Martin Luther’s 95 Theses helps readers understand both the context and the content of the Ninety-Five theses. This short book contains three specific writings of Luther and a concise introduction which sets the context for Luther’s first works. The three documents are the 95 Theses, obviously, Luther’s letter to the archbishop of Mainz, which he attached to a copy of the Theses, and Luther’s 1518 Sermon on Indulgences and Grace. “To understand these three documents,” says Wengert, “is to understand the academic, ecclesiastical and popular origins of what later historians have come to call the Reformation” (xiii). Wengert knows the importance of these documents and helps readers to see both their relevance to one another and their insight for the modern reader. He begins with a helpful introduction to set the context of the Theses. An explanation of late-medieval teaching on Penance gives readers the foundational building blocks for rightly understanding Luther’s criticisms. From there he moves towards developing the relationship of indulgences to Penance and the evolution that they undergo over time. In addition he gives readers something of an outline of Luther’s own evolution on the issue of indulgences. His introduction to the Ninety-Five Theses proper also serves to set important boundaries for our interpretation and reading of the document. I was particularly struck by Wengert’s analysis of the popular imagery of Luther nailing the theses to the church door. He notes that Luther did not actually nail the document, and in fact there is some debate as to whether he ever actually posted them at all. That was news to me, and very interesting. He continues by giving an introduction to both the letter to Albrecht of Mainz and the Sermon on Indulgences and Grace. Chapter one shifts towards the actually commentaries. First the commentary on the Ninety-Five Theses and then in chapters two and three respectively he moves to the other documents. Wengert’s ability to parse the meaning of Luther’s language is extremely helpful for the modern reader, and his historical/theological glosses help us to grasp the various points within their original world. Most helpful, from my perspective, was Wengert’s breakdown of the format of the 95 Theses. He demonstrates the flow of Luther’s argument and shows how it follows a particular common formula of the day. This provides some helpful insight on what the major shifts in the document are doing and how they build towards the main premise of the document. This is such a short (52 pages) and yet immensely helpful book. Those who are interested in the 95 Theses in particular must definitely read this volume. It is accessible and a simple read, but with a wealth of insight that pop-church history does not offer. 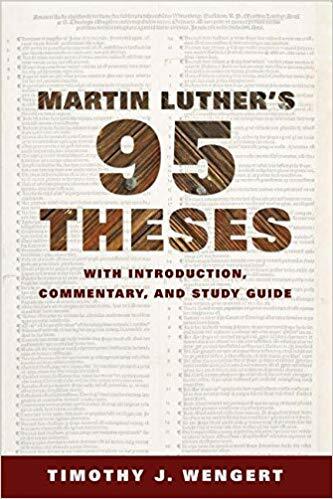 Those who read Luther’s 95 Theses will find that Dr. Wengert gives the needed clarity on both the context and the content of one of the most important Reformation documents known to us. In many ways this book grants access to Luther’s world and work in order to help us actually understand and appreciate it.